Thanks for the excellent summary! I was planning on trying the towers, but I think your summary has convinced me to experiment with buckets as well as the sheet mulching, provided I can get manure to prepare the bed in the coming weeks – I think I can get my hands on a few loads of composted horse manure for free – if I can, I’ll try both methods. I really like the ease of harvesting in both methods. I speared a few potatoes last year when harvesting (our first attempt … it was bound to happen) which pained me given our effort. They were still tasty – just roasted them that evening. One other question – with techniques like the tower or bucket would you reuse the soil? I was thinking you might be able to, but would want to give it a re-charge by adding some compost. Again – what a great and inspiring site! I would reuse the soil, just not for potatoes again. I took the soil from our towers and spread it into my kids raised bed garden, and the rest on some of our kiwis. Especially with root/tuber crops I am concerned about soil pests building up. That said, Will Allen of Growing Power does ALOT of container planting in his greenhouses and he NEVER changes his soil (primarily greens and tomatoes) just top dressing with worm castings. It may be a practical compromise (he has like 10,000 containers – changing them would be near impossible), but he has few issues. Rob, thank you for putting in all this work and keeping such detailed records (i.e., doing hard-core research)! Ok, so who’s replicating this experiment and with what cultivars next year? 🙂 Me, I’ve got space and to spare, so I’m planning on sheet mulching again next year. I need to weigh my seed potatoes next year; this year I planted a sack of egg-sized potatoes I estimate weighed 6-7 lb (certainly less than 10) and got 85 lb of potatoes in a total of 75 square feet. Well that’s interesting, if a little disapponting for you. I have copied your idea in a crate that came with some tiles and the sebago potatoes are doing very well so far. I am in Australia so will not expect to harvest until Christmas – hope my yield is a bit better than that. I do have traditionally grown ones though just in case. Nice write-up, Rob, and thanks for the nod. I’m definitely not through with the potato bucket experimentation. I’ve got two directions I’d like to try next year. I’m eager to try new things, but also grateful for and looking forward to the restful winter season first. thanks – i thought it was just me. i tried potato towers in chicken wire cages – i just got lots of stems and potatoes way down the bottom. Perhaps an alternative technique is to keep hilling your potato towers until a certain point in the season (either decided by date or by height of soil), and then to leave them alone to develop a full leaf area to set the maximum amount and weight of potatoes? It sounds like you need to leave enough time at the end of the season for the potato plants to really develop a good leaf cover, and continually hilling them sets them back in this regard. I tried potato towers (made of chicken wire, so good drainage) this year. Sadly I used Kennebecs. About a fifth of the potatoes set some tubers above the initial planting level, but not very many. It really wasn’t worth the work of filling the tower. I’ll stick with trench planted potatoes in the future with a lot of mulch. I read your blog regularly and appreciate your detailed explanations. Looking forward to growing some potatoes next year. I will try the tower again as an experiment. But more likely looking at a traditional hilling method, or straw. I posted my results over at frugal gardener, so I won’t repeat here. Suffice it to say that I won’t be doing more towers — I’ll reuse the two I made for other things in a rotation, and I’ll probably include nightshades in that rotation, but I’ll just fill the soil to a comfortable depth and plant in them and forget trying to force them tall. With the time I save I’ll be building more self-watering containers out of 5 gallon buckets — easy care, high yield, small footprint. Supposedly late varieties do better in towers – so look for Late, High Yeilding varities like Burbank Russet, Bintje, Romanze, Desiree, etc. I will be putting 3 of them into towers next year and will firm up my cultivar choice when I order in January. @Kate – you bet! I am also looking forward to Winter’s time for reflection and learning. I still have about 150#’s in the ground – hopefully none by the end of today 🙂 – and need to mulch / cover crop about 2000sq ft but things are winding down for sure. 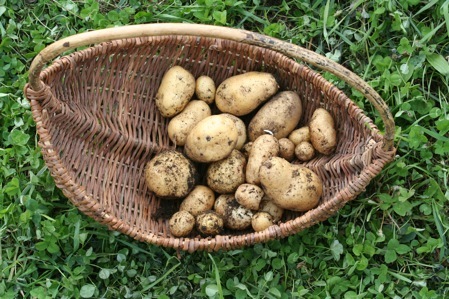 @Eric – Your potatoes looked great -no scab or anything- but I agree they are really undersize for Kennebecs. Something the towers will need to work around. Like Darren said, we’ll likely need to stop hilling at 60 days or so – that should give a late variety like Burbank another 2 months to grow a thick canopy. Good luck! While I’m sorry to see your potato growing experiment didn’t pan out, it’s nice to know someone else has had the same poor results I did. From 3 lbs of Inca Gold, from Ronnigers Seed Co, I ended up with 1.5 lbs of potatoes. When I opened the box I found a root structure a lot like yours – a 15″ root with a small cluster of potatoes, topped by more vine with no potatoes. Thanks for posting a recap. I found your recommendations to be helpful, still not sure if I’m going to try growing potatoes in a tower next year. thanks for the great summay. my potatoes do really well grown traditionally so i’ll stick to that. around here thick straw mulch wouldn’t be idiot proof – the rodents would love it! I second (third?) the results. I got about 1# of reds from one bed, marble sized yukon golds, and none at all from the other 3 towers which held blues, fingerlings, and more reds. I plan to check out Kate’s site regarding bucket plantings and try that; some of my issues with the towers were also drainage — two of them did have potatoes but they were so water logged they were rotted. I planted yams very late in the season and just harvested as we had our first frost; I got about a pound of smallish yams (from one slip) but it was considerably better than the potato harvest! Plus, the plants tolerated the heat much better than the potatoes did. 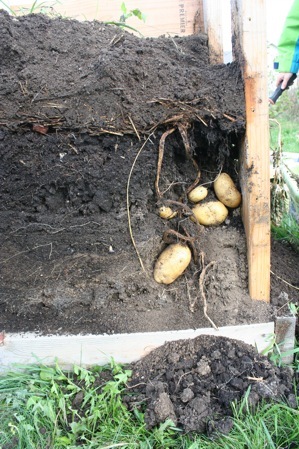 I experimented with a potato tower in 2009 with similar results. Great potatoes on the bottom, but no potatoes grew above the first level of the tower. I’ve documented the whole adventure over at Mud Songs. I’ve been poking around online looking for evidence that the potato tower actually works (100 pound yields, etc. ), but so far, no dice. I did, however, find someone who managed to grow 25 pounds of Yukon Golds and I think she may have turned me on to a trick that might make potato towers worth all the effort. You can check out the details at Mud Songs if you like, but I think it all comes down to very careful hilling of the plants as they grow. 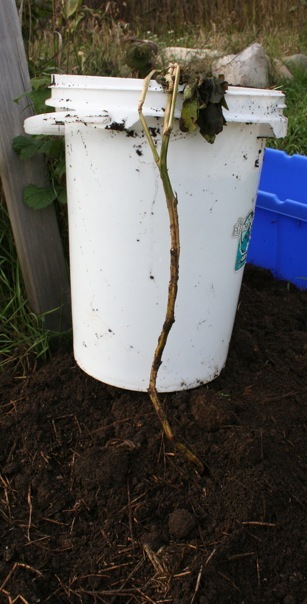 If the lower leaves and stalks are exposed to sunlight, they harden and the roots will not develop under the new soil. If you let your plants grow into a jungle before you add more soil around them, then it’s game over. The stalks need to be covered immediately while they’re still soft. That’s my best guess anyway. Good luck. 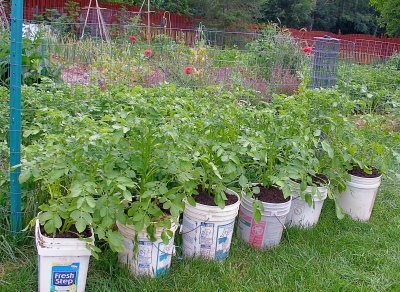 The article at this link http://www.denverpost.com/grow/ci_14839542 lists five steps to growing potatoes successfully – it seems that someone grew 124 pounds in four square feet – it does not say how many pounds they planted – the guy who talked about the method got 84 pounds, but doesn’t mention how many pounds were planted. One of the steps they say is to plant in each layer as you go up, which means many more plants, and pounds of seed potato. So perhaps getting 25 pounds for one pound of seed is an outstanding feat. This article recommends adding soil every time there is twelve inches of growth. Funny how many different ideas there are on how to maximize yield – there is still so much we don’t know about how plants grow! Keep working on it! Try using scrubbed and disenfected truck tires – Learned this from an older Jamaican- Use a mix heavy in organics, and can stack 2 high, leaving spacers between the tires. Paint outsides white only if must. 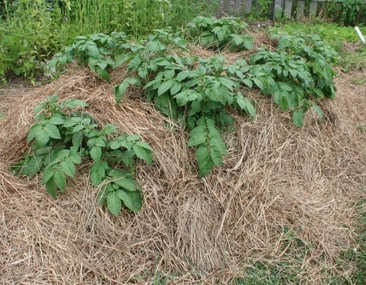 Best to ‘mulch’ with leaves/grass clippings… Workrd for me with several root crops, including cassava, sweet potatoe, and bonito. Got good harvests. @Alice: I’d recommend against using tires. I’ve heard they can leach heavy metals into the soil.